Fr. Pascal Paschal Nguyen Ngoc Tinh, OFM, the head of The Liturgy of the Hours Group, sent me a welcoming invitation even before I left for Thailand and Myanmar. 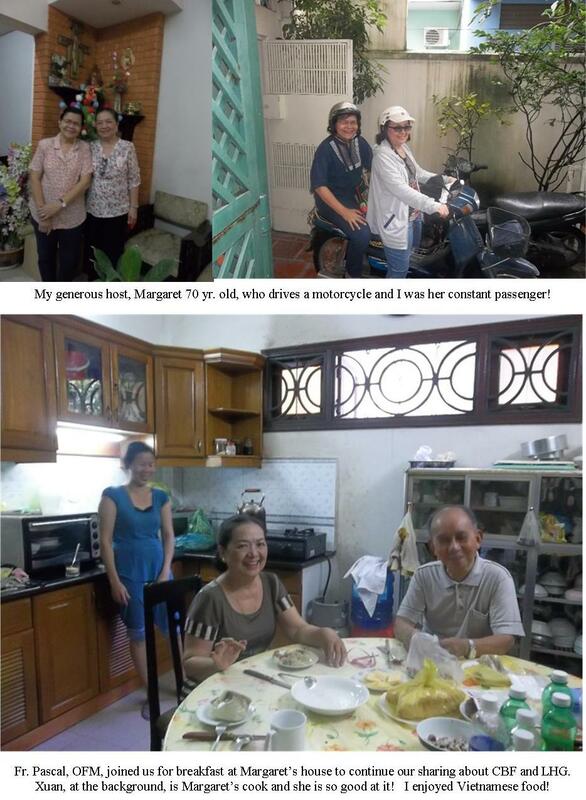 Margaret Nguyen Thi Hong Sen sent me welcoming emails to her house and Fr. Joseph Tran Hoa Hung, SDB duplicated the warm welcome to Viet Nam. 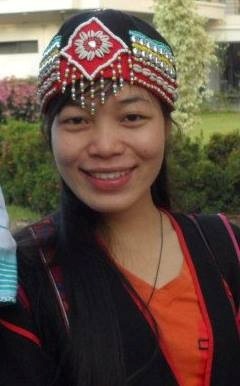 I was so excited to meet the people who compose the Liturgy of the Hours Group and to see Viet Nam, its people and the Catholic Church there. Fr. Joseph Tran Hoa Hung, SDB often represented the Liturgy of the Hours Group in the CBF workshops, assemblies and meetings. When I asked him what the Liturgy group is doing, he answered me “Bible Translation”. 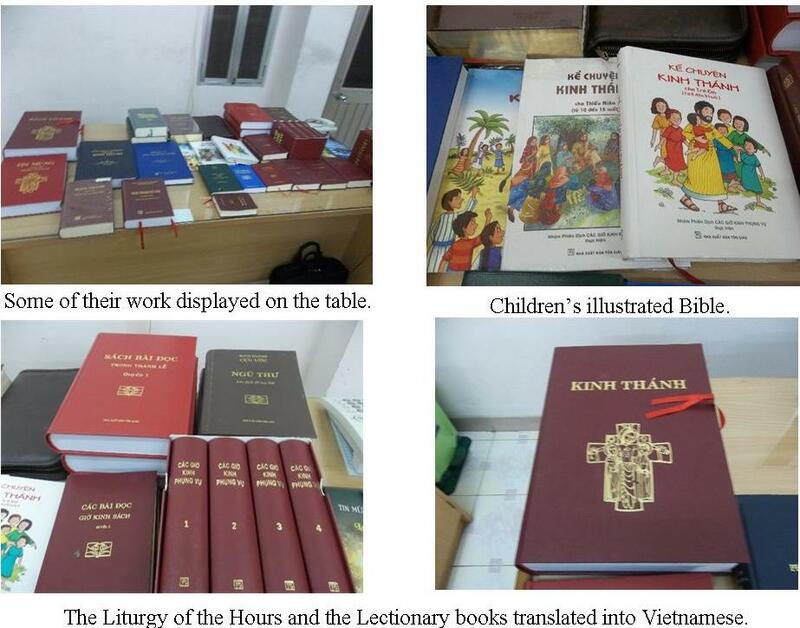 The Liturgy of the Hours Group is composed of priests, sisters and laymen who are all Catholics working on translating the Bible and the Liturgy of the Hours book in Vietnamese. They are also publishing the Lectionary in Vietnamese. They got financial help from the United Bible Societies. The pioneers are these first four who started the LHG in 1971: Fr. 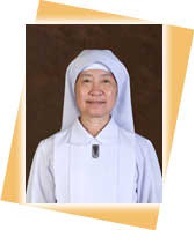 Pascal Nguyen Ngoc Tinh, OFM, Fr. 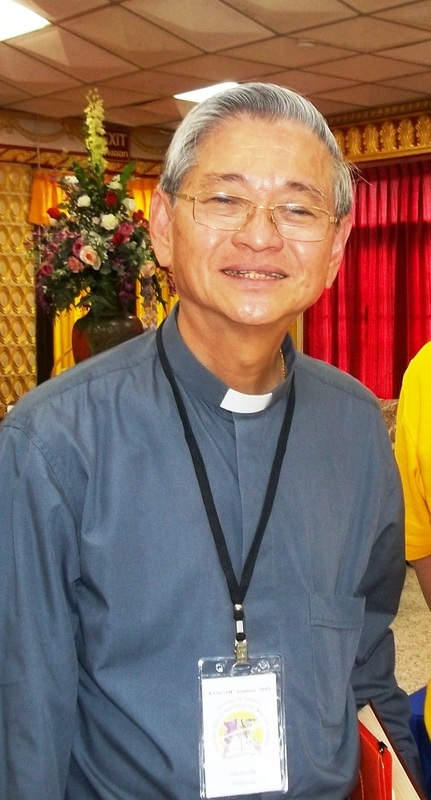 Albert Tran Phuc Nhan who died in June 2014, Fr. Andrew Do Xuan Que, OP and Fr. Xuan Ly Bang who served until 1975 only. Of the pioneers, Fr. Pascal and Fr. Andrew are still active members until now. I am very grateful for their warm hospitality. I was enriched and inspired by the sharing. I enjoyed the welcome lunch and the despedida lunch with the group. The group does not only love their work but more so, they enjoy each other’s company and share a friendship that is strengthened by the Word through the years. 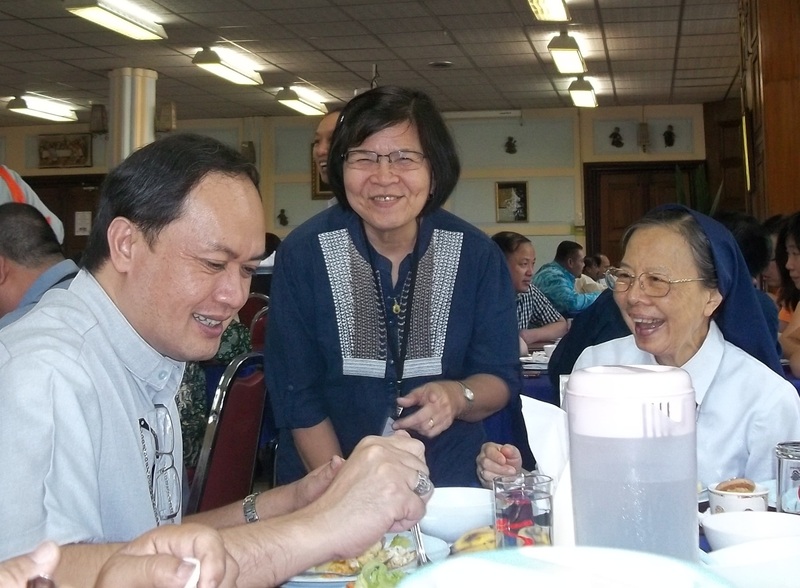 Bishop Francis Xavier Vira Arpondratana, the president of the Catholic Commission on Catechetical Education – Desk for the Biblical Ministries of the Catholic Bishops’ Conference of Thailand and Fr. Somkiart Trinikorn, the person in charge of the Bible Commission of the Pastoral Council for the Archdiocese of Bangkok joined forces to organize a seminar on Bibliodrama entitled the Bibliodrama Exchange 2014. Fr. Oscar Alunday, SVD of the Divine Word Missionaries – Philippine Northern Province and Miss Mary Almonte of Notre Dame de Vie Institute from the Philippines were the guest speakers of the seminar assisted by Bishop Francis Xavier Vira Arpondratana, Sr. Bang-on Mathurotsuwan of the Congregation of the Sisters of the Sacred Heart of Jesus of Bangkok, Teacher Prapa Virasilp of the Commission for Catechetical Education – Desk for Catechesisof the Catholic Bishops’ Conference of Thailand, Teacher Tadsanee Mathurotsuwan of the Catechetical Education Department of the Pastoral Council of the Archdiocese of Bangkok and Professor Monsingh Kraisomsuk of the Bible Commission as the event’s coordinator. 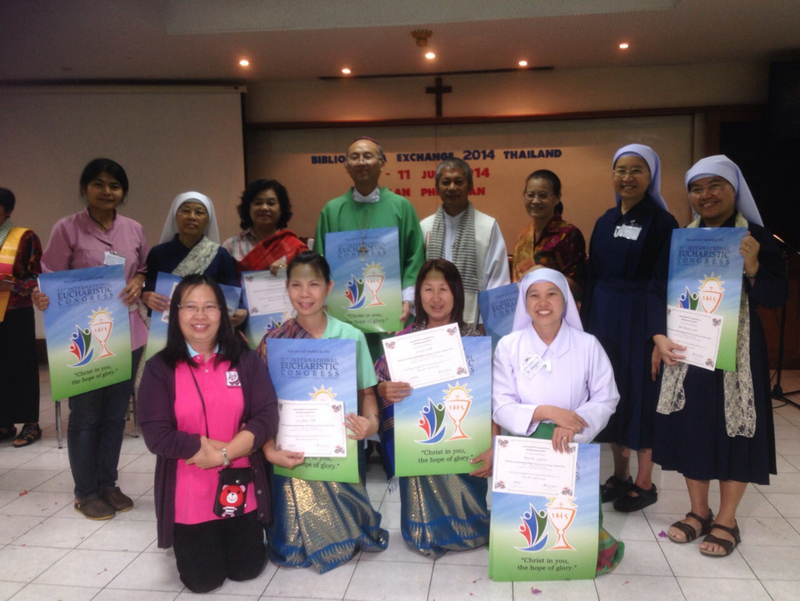 There were 28 participants in this course, which was promoted and supported by the Bible Commission of the Pastoral Council of the Archdiocese of Bangkok. To share the different Bibliodrama programs, that were organized in the past in different places in order to learn from the differences and, eventually, improve the skills in the organization of Bibliodrama programs. To learn new methods from programs applied to different groups so that training participants may be able to apply Bibliodrama to the local culture in a better way. To plan for a regular Bibliodrama Exchange training programs in Thailand (every 2 years) to assure continuous training and improvement for facilitators and participants of Bibliodrama in Thailand. 1. 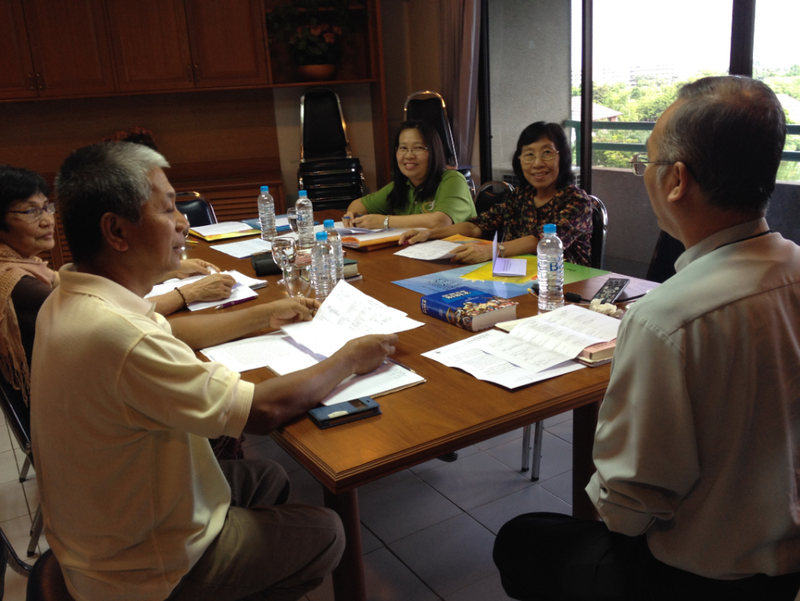 Bibliodrama Thailand team reports (by diocesan team, institute, congregation). At the end of the Bibliodrama Exchange seminar, the guest speakers suggested the BIBLIOLOGUE method as an approach – a bibliodrama element, APPRECIATIVE COMMUNICATION(I thank you, I’m sorry, I hope that…) and INTERVIEW. After this session, there was a group discussion and they were given a question which they can reflect on and share their insights. The question was: As a teacher, a catechist, a religious, a trainer, a lay person, a youth leader and a person in charge of the Bible Commission, how can you promote or help turn the proposal of the apostolic exhortation of the Holy Father into a reality? The session was then followed by the Holy Sacrifice of the Mass to conclude the seminar and certificates were distributed by Bishop Francis Xavier Vira Arpondratana. The entire Bible Commission and all the seminar participants intend to continue the exchange of ideas, sharing of experiences and proposal of alternatives in the future following the guest speakers’ suggestions. On the 21st to 23rd of July 2015, information about the next event will be disseminated. We thank the entire Bible Commission, our guest speakers and everyone who sent their staff to participate in this seminar. 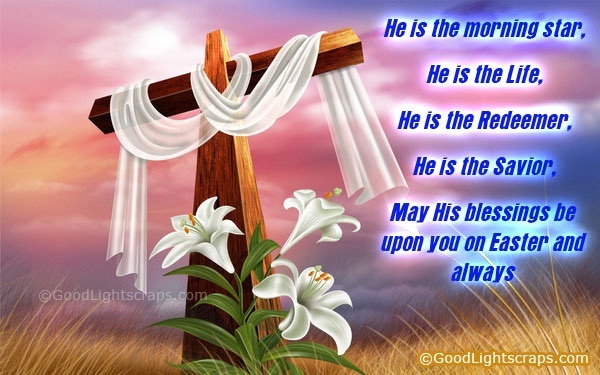 May God bless all of you! The Bibliodrama Exchange 2014 seminar was a synthesis, a way of sharing and a review of what we have learned from the other participants. It was a way to encourage each other reciprocally. The speakers reassured us that we can apply Bibliodrama anytime. It was a discovery of God in a simple and natural way like when we see each other every day. I hope that there would be another Bibliodrama Exchange seminar in order to review what we have learned and to provide the participants a chance to stay still and commune with God through His Words. Thanks to God for this seminar because I was able to find quietude and God in a simple way. 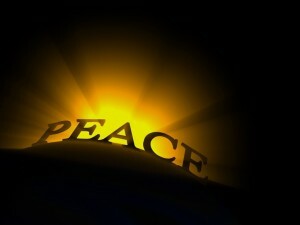 I pray that the love and peace of God may be with all of us. I felt that this seminar seemed like a retreat. It was an occasion of reflection through the Word of God as the center of contemplation. At the same time,we learned varied techniques in sharing the message of the Bible to others in a lively way. Personally, I intend to use these forms in sharing the Word of God to students and parish community under my responsibility so that they too may experience the Word of God in their hearts and find happiness in those words. definitely another form of harnessing the power of the Bible in improving Christian life.Teachers and trainers who participated in the seminar can apply this technique in teaching catechism and prayers and in organizing seminars with various topics for different groups made up of either adults or children. It is an effective means to liven up the training courses. Special thanks to Bishop Francis Xavier Vira Arpondratana for introducing this new way of reading the Bible. 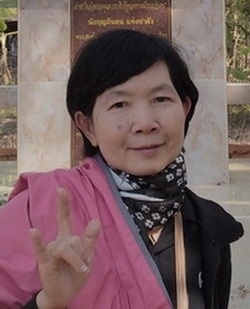 Ms. Sumalee Mukpaksacharoen, Thailand Catholic Society for the Deaf under the Department of Christian Laity of the Pastoral Council of the Archdiocese of Bangkok. I was very impressed. For me who is a deaf person, I would only remember a little even if I study the Bible every week. But after this seminar, dancing to the music and the presentation of a play based on a part of the Bible, which are all a novelty for me, helped me to understand better the Holy Scriptures. They also helped me to reflect more on the Word of God in our own lives. In one of the workshops while we were dancing we were holding hands. When I placed my hand on the hand of the other and the other person placed her hand on mine, I felt the love of the brother or sister whose life is centered on God. I did not study much like normal people did, so when we were asked to go around and look for one word from a variety of different words from the Bible, I was worried at first because I did not understand anything. But I felt that the Holy Spirit helped me to understand the various words and choose well. I chose the word “back (come back)”. When I saw that word, I thought of my daughter who was not baptized into the Catholic faith. I want her to have her conversion. I will pray hard so that she too may become a Catholic. 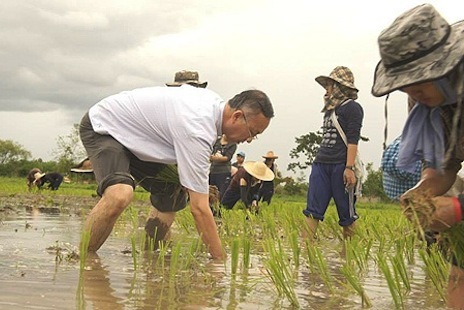 The bishop of Thailand’s northernmost diocese, which is largely rural and dominated by hill tribes, has begun himself working in the fields alongside his flock, noting the importance of agriculture there. 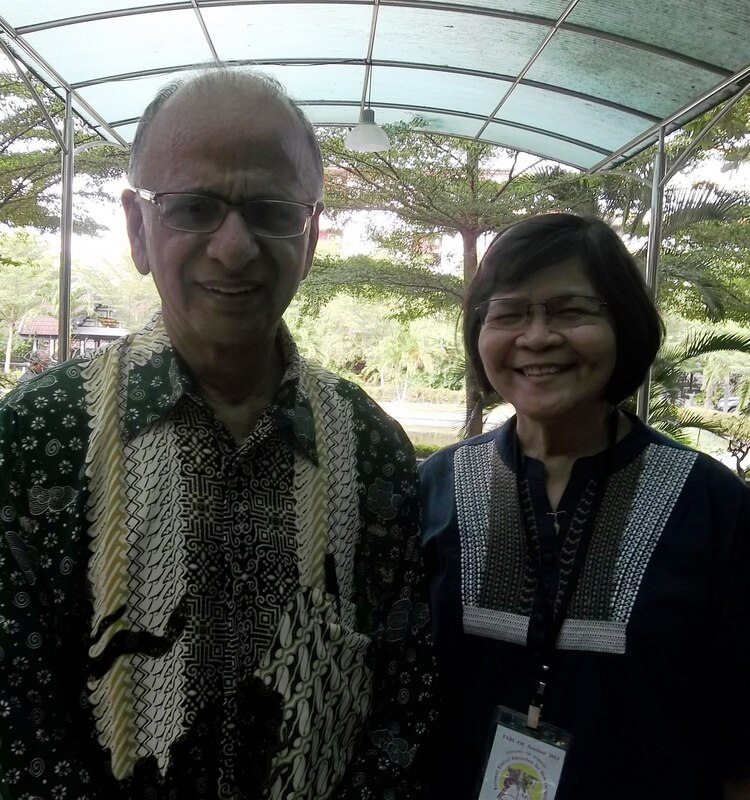 “I try to understand the farmers, and to promote Catholic social teaching so that they can contribute to a holistic human development, can work for the common good of their family and for the entire nation,” Bishop Francis Xavier Vira Arpondratana of Chiang Mai told CNA. The diocesan economy is largely agricultural, and the mountainous region lacks many amenities such as electricity and modern communications and highway infrastructure. And so Bishop Arpondratana took to the rice paddies with gusto. “When someone asks, I would like to open my heart and mind and be with them,” he explained. 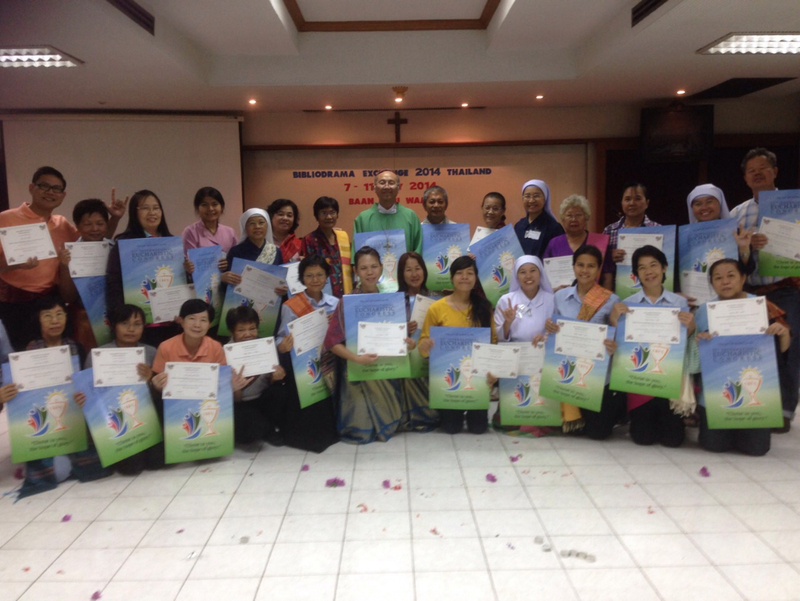 His work with farmers has inspired both them and catechists in the Chiang Mai diocese. He has organized a Lenten rice campaign in the diocese centered on prayer, penance, and alms giving. Bishop Arpondratana, 58, was ordained a priest of the Bangkok archdiocese, 430 miles south of Chiang Mai, in 1981, and served there until his appointment as bishop in 2009. The seminar was attended by more than 100 participants from different parts of Asia. There were Bishops, Priests, Sisters, Brothers, Lay People involved in the Biblical Apostolate. The lay people comprised half of the participants. The invitation was given out by the Executive Secretary of FABC-OE, Fr. Jacob Theckanath. 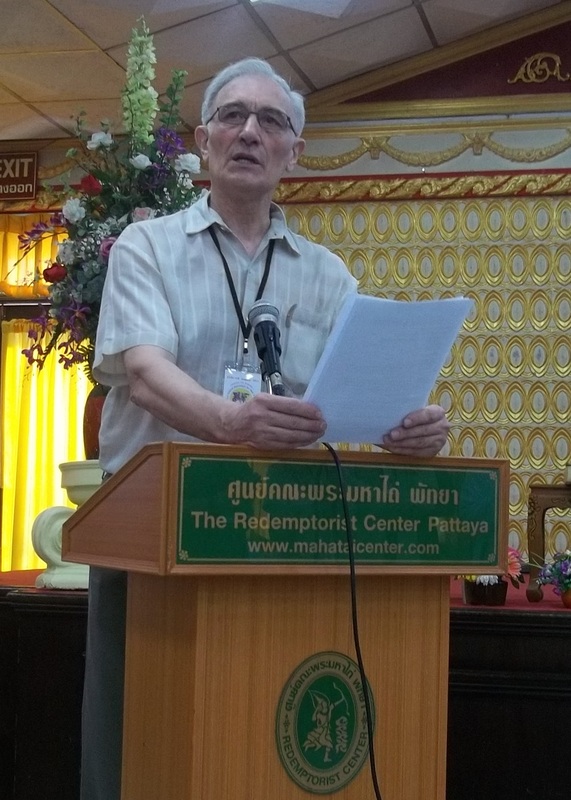 He was delighted by the overwhelming response to participate in this seminar that he had to change the venue from the Camillian Retreat House in Bangkok to a bigger one at the Redemptorist Center in Pattaya City. 1. “I have an Obligation to All Peoples” by Archbishop Thomas Menamparampil, SDB, Chairman, FABC-OE. Archbishop Emeritus Thomas shared with the participants his acceptance speech when he was conferred an honorary Doctoral Degree on Missiology by the Urbaniana University in Rome, Italy on November 14, 2013. Here, he shared his missionary experiences, the values guiding his work, and his work plan to reach out as much as he can – indeed to “all peoples” as St. Paul did in his time. “Crossing the borders” as a missionary to diverse cultures and peoples not so much to teach his own concepts but to lead them to understand these by using the people’s own specific cultural vision of things. He introduced “the Mission of Anger-Reduction since some obstacles to missionary effort are prejudices, memories of historic injuries and perceived vested interests. It is part of evangelical work to heal the memories of historic wounds at the ethnic, cultural, national and even civilizational levels” – he said. 2. “Biblical Formation of the Laity for New Evangelization” by Archbishop John Ha of the Archdiocese of Kuching, Sarawak, Malaysia. Archbishop John talked about New Evangelization as used by Pope John Paul II by which he meant proclaiming the Gospel with new ardour, new method and new expression. The idea behind it is to make the Gospel relevant to the current generation. The scope of the new evangelization ranges from pre-evangelization to primary evangelization to re-evangelization and to on-going faith formation. But the content of the new evangelization does not change – it is the same Gospel which Jesus Christ proclaimed and entrusted to His apostles to proclaim, more than two thousand years ago. He further explained the elements for understanding “New Evangelization” and the New Evangelization in the Acts of the Apostles. He shared the four-week lived-in Youth Formation (K.A.Y.A.) which stands for Kuching Archdiocesan Youth Apostolate. They have been running this program every year for the past 21 years and it is getting very popular. It aims at forming participants into Christ’s disciples and evangelists through self-knowledge and knowledge of Christ. They have also a Bible Course for the Laity. It is a 3-year course run on a two-hour class per week for 3 years and leading to a Diploma. The course has 3 levels: basic, intermediate and advance. Another study program is “The Great Adventure Bible Study Programme” designed by Jeff Cavins and his team. It starts off with a “Foundation Series” and continues with studies of the Old Testament as well as the New Testament. The lecture does simple text analysis, with cross-references to other relevant biblical texts and references also to the Catechism of the Catholic Church as well as Church practices especially the Liturgy. 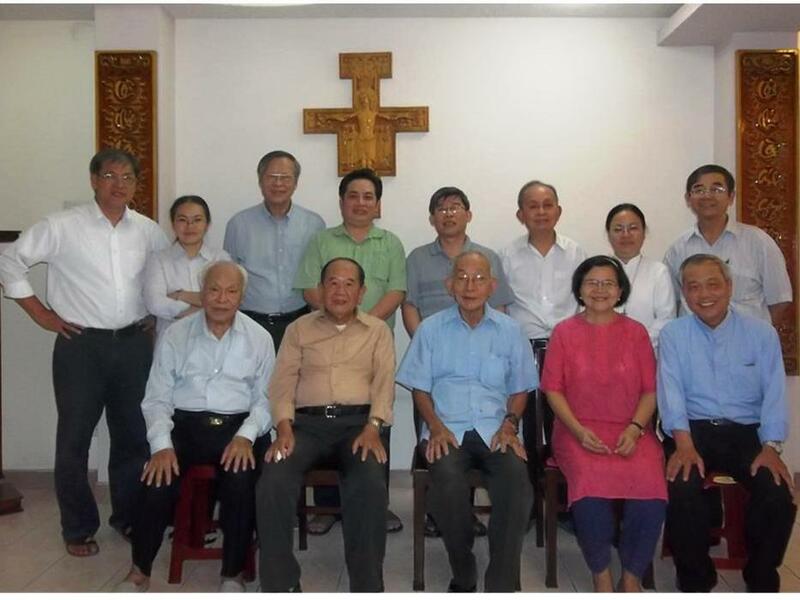 From these three experiences of biblical pastoral ministry that he has in the Archdiocese of Kuching, it has become increasingly clear that biblical formation of the laity must balance academic knowledge with spiritual application to make the Scripture come alive as the Word of God for life. 3. “Spreading the Gospel of Christ through the ‘Little Rock Scripture Study’ Program in Mainland China” by Fr. John Mi Shen of Zhaoxian Diocese, China. The Little Rock Scripture Study began in the seventies of the last century that was developed by the laity of the Diocese of Little Rock in Arkansas, in the United States. The program consists of 40 modules, drawn from the whole Bible. Learners are encouraged to take “repeated reading” and do “exercises” of related passages so that the Word is instilled into the learners’ heart and life and change their lives. In 2008, the Little Rock Scripture Study program was first introduced into Mainland China by Anthony Ng and his team – all belong to a Malaysian Chinese Catholic Group Mustard Seed Evangelization Center. They started in Guanzhou and Xi’an. Due to the shortage of Chinese materials and lack of follow-ups, the program was launched without success. 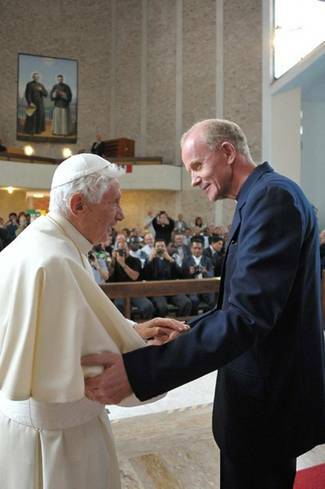 In August 2010, with the assistance of Fr. John Mi Shen of Zhaoxian diocese (Hebei province), the Mustard Seed Center has brought LRSS program back to China again and received positive responses. Several graduates of Yiwu community volunteered to promote the LRSS program elsewhere in Mainland China. Since this way of Bible-reading and doing exercises counts mostly on the efforts of individuals, it was found that it could be convenient way for Catholics living in urban areas. The large group gatherings and sharing will highlight the communal dimension of the Little Rock Program, enabling a more effective way to witness the learners’ experience and interpretation of Scripture. 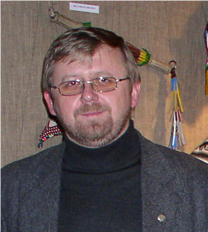 A member of the group of Fr. John Mi Shen shared with the participants (with Fr. 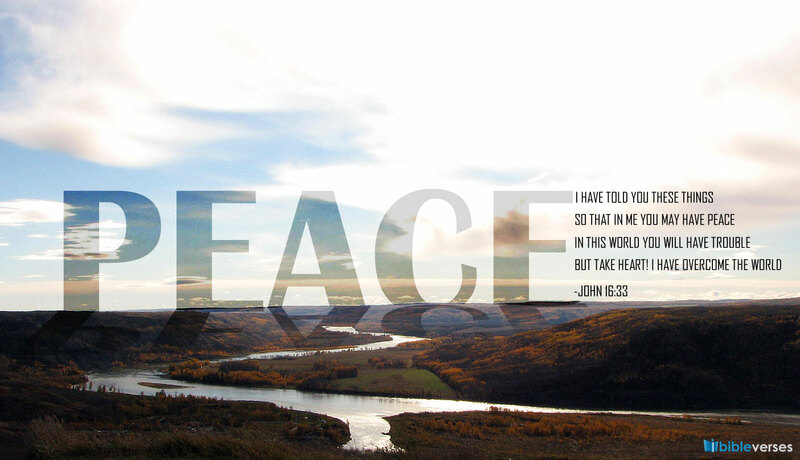 John as the interpreter), how Scripture and the program, has changed his life and his outlook in life that he wants to continue to be an apostle of the Word. That was really a touching sharing that was appreciated by the participants. 4. “St. 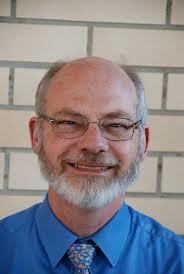 Paul New Evangelization and Biblical Pastoral Ministry” by Fr. Thomas Manjaly of India. The parental responsibility required of Paul that he nurtured his ‘children’ through personal example for imitation (1Cor 4:16). As their ‘father’ he tried to embody Jesus in himself and give visibility to Christian life for his ‘children’ to see and to imitate. Hence, he could make a genuine claim that he was mediating Christ and appeal to the communities. Evangelization, therefore, is a person to person approach sharing a Christ-experience. 5. 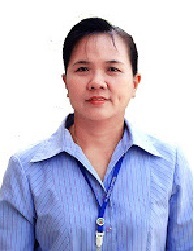 “Cross Cultural Bible Apostolate in Thailand” by Prof. Kirti Bunchua of Thailand. 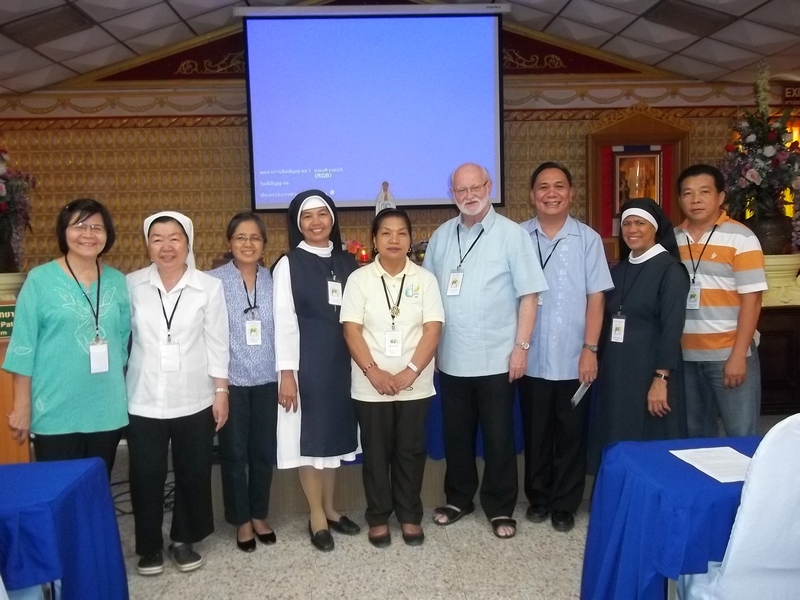 Doing Biblical Apostolate in Thailand considers the Thai philosophy and way of thinking. Bible Apostolate is a means to understand God. To understand God is not the same as to love God. To love God does not require knowing Bible Apostolate but requires something of God. There is a need for a dialogue between the Buddhist way and the Christian way. Words may be misinterpreted or misunderstood but a living witness to Christ can say everything. 6. “Evangelii Gaudium of Pope Francis: Orientations for Biblical Apostolate” by Bishop Pablo Virgilio David of the Diocese of Pampanga, Philippines. “New Evangelization in the Light of the Scriptures” – It is evangelizing that must draw light from Scriptures, not the Scriptures from evangelizing. In the Bible you have the greatest stories ever told—the story of salvation. Our mission is to teach people how tell the tragic and otherwise absurd stories of their lives into stories of salvation by viewing them in the light of the story of Jesus, God’s story of redemption.” Hope is something all people look for in the midst of the great temptation to despair. Hope is what evangelization is about, not proselytization; it is what evangelization really has to offer—a good news! New evangelization is about helping people reflect on human experience with the basic aspiration: “How do I make sense of it? What is the meaning of it all? What is God saying to me/us? How am I/are we invited to respond?” The Scriptures are there to help us hear God speaking to us in contemporary human experience. They are like a hearing aid that mitigates the human deafness to God’s voice, God’s messages. 7. “Biblical Apostolate and New Evangelization 50 years after Vatican II” – Insights on Roads of the Word Ahead” by Fr. Ludger Feldkaemper, SVD of Germany. Fr. Ludger had been very much involved in the Catholic Biblical Federation (CBF) as General Secretary for many years. He had increased the number of members of CBF during his term, inspiring and encouraging more people and groups to be engaged in the Biblical Pastoral Ministry. CBF was born in 1969 to assure that the directives of the Vatican Council II concerning “Sacred Scriptures in the Life of the Church” (Chapter 6 of Dei Verbum) would be put into practice. After Dei Verbum was Pope Paul’s Ad Gentes then Evangelii Nuntiandi on Evangelization in the Modern World. In 1993 the document on “The Interpretation of the Bible in the Church” – a commentary for all practical purposes on chapters III and VI of Dei Verbum was a special interest for those involved in the biblical pastoral ministry. The Synod on the Word of God in the Life and Mission of the Church in 2008, Pope Benedict fulfilled the CBF desire since its Plenary Assembly of Bangalore in 1984. The post synodal exhortation Verbum Domini published on September 30, 2010 can be considered the handbook for the implementation of the Council’s directives on Sacred Scripture not only on the Life but also the Mission of the Church! Now, we have the “Joy of the Gospel” that fills the hearts and lives of all who encounter Jesus. We are all “missionary disciples”! 8. “Greening the Catholic Church Today: Bringing to the Fore a Biblical Eco-Spirituality in the Era of the New Evangelization” by Prof. Lysander P. Rivera of the Philippines. Prof. Rivera spoke about the global phenomenon of Climate Change with its effect on several calamities that affected the different parts of the Philippines and its recent strong impact on the people of the Visayas with Typhoon Haiyan. Pope John Paul II paved the way for the ecological awareness and conversion to take its rightful place in the Social Teachings of the Church. In 1971, through the Social Encyclical Octagesima Adveniens, Pope Paul VI identified environmental issues as an urgent and wide-ranging social issue that concerns the whole human family and thereby urged all Christians to take responsibility for the future. Entitled “Peace with God the Creator; Peace with all of creation, the message of Pope John Paul II exhorts all Christians to treat all living species on earth with utmost respect, for they, too, possess the same dignity that we have as “children of God”. Furthermore, the Pope laments the reality in today’s world, “the dramatic threat of ecological breakdown is teaching us the extent to which greed and selfishness – both individual and collective – are contrary to the order of creation an order which is characterized by mutual interdependence. It was an interesting and entertaining presentation using powerpoint slides, music video, dance video, the popular social networks, websites, SMS, Podcasts, and Blogs as the way of communication especially among young people. Many people use emails. 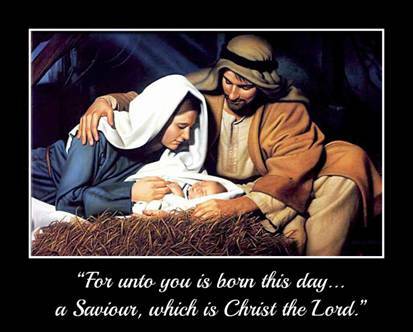 There are web-based Scripture reflections. The Marian prayer (Rosary and Angelus) is an aid to meditating on the holy mysteries found in the Scriptures. Pilgrimages to the Holy Land are encouraged. People’s lives are more likely to be changed through the heart than through the mind. It is here that the word of God brings about transformation in the lives of people. There are great possibilities as well as challenges in our ministry, let us encourage people to become increasingly familiar with the Sacred Scriptures using every means at our disposal. 10. “Lessons from Blessed Gabriel for Biblical Apostolate Today” by Ms. Cecilia Chui of Hong Kong. Blessed Gabriel Maria Allegra, OFM is the St. Jerome of China and Asia. As an Italian missionary to China, he took pains to study and learn the Chinese language. He translated the Bible from its original languages to Chinese so that it can be easily accessible to the Chinese people. He modeled to the people “Ordinary Holiness” – to live their ordinary lives in an extraordinary way. He is also an example of “crossing the borders” from Italy to China. The theme on “Crossing the Borders: Renewed Biblical Apostolate for New Evangelization” was successfully realized in this seminar. Lectio Divina, Eucharistic Celebrations, Morning Prayers, Bibliodrama prayer dances, individual and group sharings made the encounters more meaningful and enriching. We had crossed the border of language, culture and distance. We inspired each other in the biblical pastoral ministry. 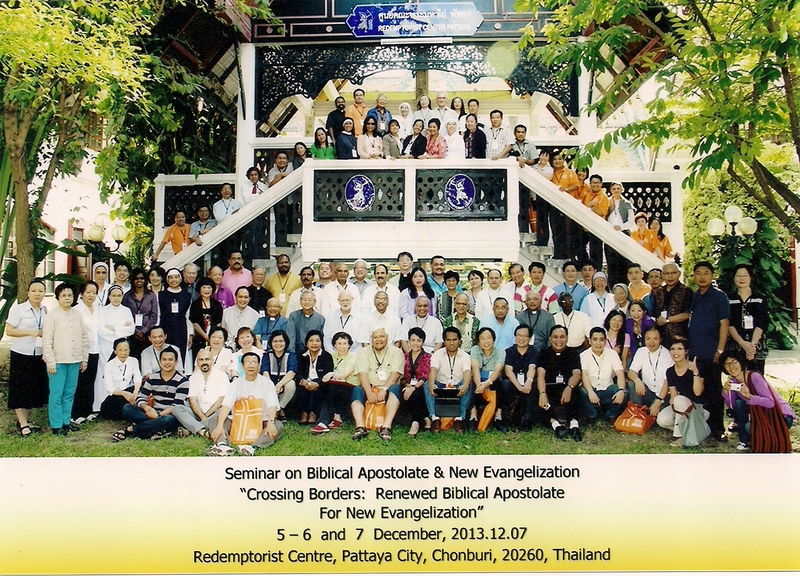 Many wanted to form an association of individuals involved in the Biblical Apostolate in Asia-Oceania. The CBF members of Asia-Oceania who were participants, had a 3 hours meeting after the seminar on December 8. It was agreed that every country, organized by the full member, will continue to reflect and discuss the Theme for the next Plenary Assembly in 2015; CBF Constitution and its possible amendments for the next PA. The region’s nominee for CBF President is Bishop Pablo Virgilio David, DD of the Philippines. The region’s nominee for CBF General Secretary is Fr. Jacob Theckanath. There are other nominees from the other regions as well. The group will also discern on how to strengthen the region and the sub-regions in terms of structure, personnel and system. These will be shared with the other countries of the region. We shall find a common stand and decide accordingly. Indeed, the FABC-OE Seminar on Biblical Apostolate & New Evangelization and the BIBA IV was a big success! We had crossed the borders of Mainland China, Macau, Hong Kong, Taiwan, Vietnam, Cambodia, Myanmar, Indonesia, Malaysia, Singapore, Brunei, Philippines, Thailand, Korea, Japan, India, Pakistan, Sri-Lanka, Bangladesh, Nepal, Australia, Tonga, Haiti, Samoa and even Germany, the Netherlands and Italy. We have strengthened our respective Biblical Apostolates/Ministries through the conferences, sharing and celebrations. We have renewed our commitment for a New Evangelization with its new ardour, new in its methods and new in its expression. With the lay people comprising half of the participants, New Evangelization needs to be practical, relevant and contextual to their daily lives! A big “THANK YOU” to the Funding Agencies supporting this event, the Speakers, the Facilitators, the Moderators of each day, Liturgy groups (Sr. Emma Gunanto who prepared our Lectio Divina guide, Menchie Rojas for the morning prayers & Cecilia Chui), the logistics committee, documentation and all those who in one way or another who had contributed to the success of this seminar. Special thanks for Fr. Alberto Rossa, CMF of the Claretian Publications who gave for free to each one of the participant a copy of Pope Francis’ “Evangelii Gaudium – The Joy of the Gospel”! Thank you to Fr. Michael, CSsR and the Redemptorist Center Community and Staff for providing us with comfortable rooms, delicious food and friendly service. Thanks to Fr. Jacob Theckanath who is the man behind the organization of this Seminar! appointed new CBF General Secretary. 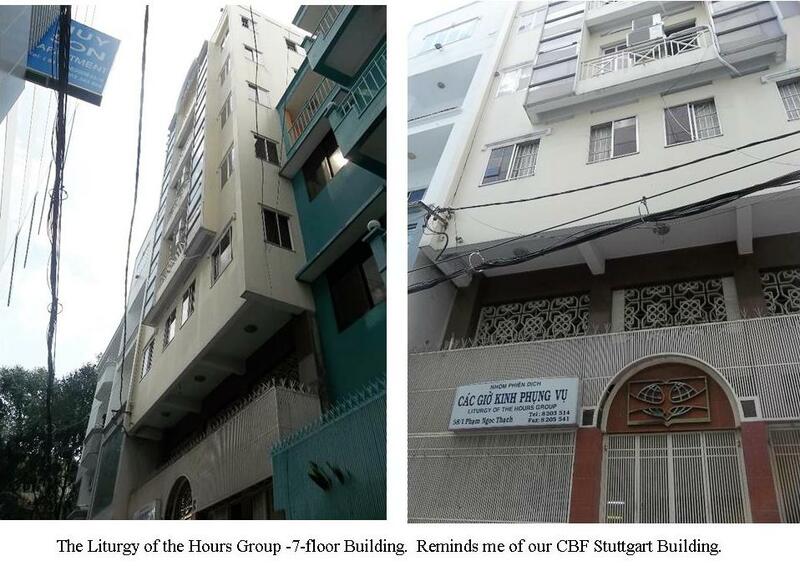 to the office of general secretary of the CBF. 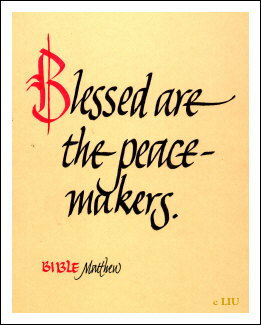 “We are going to have our National Seminar Workshop for building peace in the light of the Bible on July 6- 12, 2013. We need peace and harmony in the country among different religions and ethnic groups. The aim of the Seminar is to find some solutions for peace. This is also our regular national meeting held every six months for all those who are active in biblical ministry to encourage one another, especially because our ministry is still very young. We expect more than 80 participants from different dioceses. But we have no funds and there is no response from the KIM yet. It is difficult to get local support too. We do not have other ways and means. The participants come from very far places. It is difficult for them even to pay for their own traveling expenses. I will have to go about 400 miles to reach the place too. The roads are still bad in many areas. Traveling is still difficult for mountaineers although better compared to before. There is little possibility to get support from our group. I have to choose a convent for our venue. Anyhow I trust in God and his providence. Kindly keep us in your prayer. The Catholic Biblical Federation then of Southeast Asia unites with those who will be attending during this historic event organized by the Episcopal Commission for the Biblical Apostolate of Myanmar. We will be with you in spirit and in prayer in your pilgrim journey towards peace and harmony inspired by the Word of God. Hearty congratulations to Fr. Heinz Kulüke, the Provincial of the Philippine Southern (PHS) Province in Cebu, elected as the 11th Superior General of the SVD in this 175th birth anniversary year of the Society’s founder, St. Arnold Janssen, in 2012. The 17th SVD General Chapter, held at the Ad Gentes Center in Nemi, was also specially graced with the historic visit of Pope Benedict XVI on 9 July, six days after the announcement of Fr. Heinz as the new head of the congregation. Outgoing Superior General, Fr. Tony Pernia, welcomed the Pope to the Ad Gentes Center and recalled the distinct connection between the center and the Second Vatican Council. It was at the Ad Gentes Center that the draft of the document on the Church’s mission to the world “Ad Gentes” was prepared in 1965 by the commission headed by the then SVD Superior General, Fr. Johannes Schütte. The Pope was a “peritus” (= expert) of that commission as a young theologian. 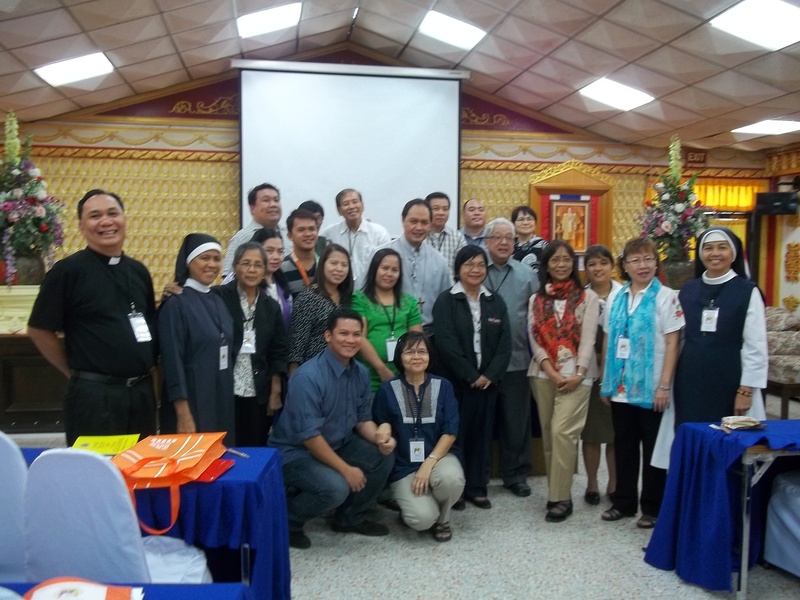 Friends of the Word based in the Philippines, Indonesia and Hong Kong recalled fondly meeting Fr. Heinz, the God-desired next SVD Superior General after Fr. Tony, during the closing celebration of the 100th death anniversary of St. Arnold held at the Adoration Chapel of Divine Peace (where the Pink Sisters station) on 15 January, 2010 in Cebu. Pope Benedict’s gracious visit to Nemi on 9 July, Feast of the Chinese Martyrs and Saints, mentioned his remembrance of the 6th SVD Superior General, Fr. Johannes Schütte, as a person full of missionary zeal who had suffered in China. This highlight brought back memories of Fr. Tony’s visit to Hong Kong and Macau after his attendance at the celebration of SVD’s centennial presence in the Philippines in August 2009. That year also marked the 130th anniversary of St. Joseph Freinademetz’s arrival to Hong Kong in 1879, preparing for his future pioneer lifetime SVD missionary work in Shandong, China that commenced in 1881. Fr. Tony was accompanied by Fr. 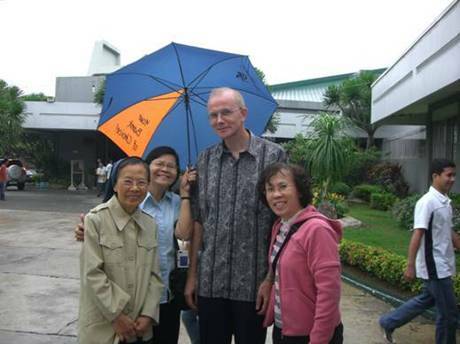 Frank Budenholzer, Provincial Superior of the SVD China Province, for the visit to the SVD community set up in Macau since 2007. The programme also included a lunch gathering with Bishop José Lai of the Diocese of Macau. On their way back to Hong Kong from Macau, Frs. 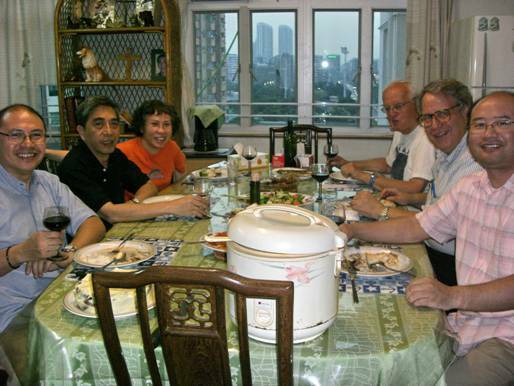 Tony and Frank enjoyed a fellowship meal with some SVD confreres, plus the presence of Cecilia Chui as guest, at the SVD House in Boundary Street. 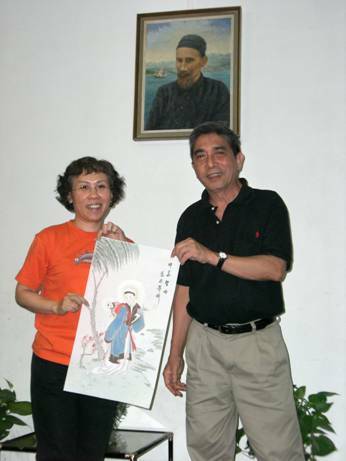 As a meaningful remembrance for their visit to Hong Kong, where St. Joseph had lived for two years (1879-1881), Cecilia offered a Chinese silk painting each to Fr. Tony and Fr. Frank. Fr. Tony described beautifully the image of the SVD and all those associated with the SVD – “Persons of the Word”, in two senses. First, a disciple of Jesus and a follower of the Divine Word, who is God’s ongoing dialogue with the world. And secondly, a person who is true to his word, who keeps his word, who “walks his talk”, who lives a coherent and integral life. We are missionaries because we wish to be witnesses to the fact that God keeps his word and is faithful to his promises. Fr. Tony’s elaboration on “Persons of the Word” resonates with Fr. Heinz’s homily and personal sharing made in Nemi following his election as the 11th Superior General: “Holding such an office requires great trust in God and His very special blessings as well as the constant prayers of confreres around the globe.” “Persons of the Word” – that was what Arnold Janssen, Joseph Freinademetz, and our Blessed Martyrs were. Going forward, may we continue be “Persons of the Word” – persons whose lives and actions are many different words which echo the Word of God, the Divine Word, Jesus Christ. Congratulations and abundant blessings to Fr. Heinz in his new responsibility with vision and dynamism! Deep thanks to Fr. Tony for his tremendous services and well-appreciated contributions in the past 12 years! May the Light of the Word and the Spirit of Grace continue to lead the SVD forward in fulfilling God’s Holy Will!